HafenCity Hamburg is setting new standards – at least in Europe – in successful integrated urban development that takes local requirements and high expectations of urbanity and sustainability equally into consideration. On an area of 157 ha, a lively city is taking shape, a new downtown on the waterfront with a fine-grained blend of workplaces and residential uses, education, culture and leisure, tourism and retail facilities. HafenCity Hamburg GmbH is presenting the full breadth of innovative urban development at MIPIM, the international real estate fair in Cannes. From March 13–16, 2018, Europe’s biggest inner-city urban development project is a main partner on the Hamburg pavilion – Stand R8.B20 in the Palais des Festivals. The focus this year is on the final plots available in HafenCity in addition to information on how the project is progressing. Plus HafenCity is treading new paths for Hamburg with the Elbtower, a sculptural high-rise right next to the Elbe bridges. Together with the new Elbbrücken subway and rapid transit station it will become a new urban hub with an influence reaching into the new urban development areas of Billebogen and Grasbrook. Finale and overture in one: The Hamburg Elbtower will be a powerful culmination to HafenCity development and at the same time a curtain-raiser for the entrée to inner-city Hamburg and the future urban development zones of Billebogen and Grasbrook. Just under a year since plans were first announced for a high-rise at the Elbe bridges in HafenCity, the developer and architect have been chosen. HafenCity Hamburg: Start for first major building in Elbbrücken Quarter Shared prevention center for two big employers’ liability insurance associations BGW and VBG to be built right next to the Elbe The groundwork is laid for the first building construction project in HafenCity’s easternmost district. Two of Germany’s biggest employers’ liability insurance associations, BGW and VBG, are planning a shared prevention center on a pivotal plot sited next to the Elbe Promenade, the subway stop under construction and the planned rapid transit station. The insurers aim to use it to train multipliers and occupational health and safety staff from companies as well as for individual counselling. About 30,000 seminar participants and visitors to exhibitions and events are expected to use the building each year. HafenCity gave the two insurance associations an exclusive option to develop the site in May 2016, and the architectural competition is already under way. Construction is expected to start mid-2018. Among the preconditions is the approval of the supervisory boards of both employers’ liability insurance associations. Southern Überseequartier is to get a new architectural appearance. Together with international and German firms of architects, Unibail-Rodamco developed new architectural designs 2015 for all 11 buildings in the neighborhood in cooperation with HafenCity Hamburg GmbH and Hamburg’s Ministry of Urban Development and Housing. The multifaceted interplay between the individual architectural designs now generates a unified urban panorama whose spectacular climax is a waterfront on the River Elbe. HafenCity Hamburg will be exhibiting in 2015 at MIPIM in Cannes, one of the world’s most important real estate and urban development fairs. From March 11-13 HafenCity will be the main representative of the Free and Hanseatic City of Hamburg on the Hamburg Metropolitan Region pavilion, further strengthening Hamburg’s international credentials. HafenCity Hamburg will be exhibiting again this year at MIPIM in Cannes, one of the world’s most important commercial and residential real estate fairs. From 11 to 14 March 2014 HafenCity Hamburg GmbH will be the main representative of the Free and Hanseatic City of Hamburg on the joint stand for the whole of the Hamburg Metropolitan Region. Its presentation will include sustainable growth, with nine projects getting under way in 2014 alone on some 180,000 sqm gross floor area (GFA), accounting for an investment volume of around EUR 650 million. At the same time HafenCity’s development trends are becoming clearer and clearer – it is growing more diverse, younger and more creative. HafenCity Hamburg GmbH is present once again this year at Expo Real in Munich. With almost 40,000 visitors and some 1,700 exhibitors, it is one of the world’s leading commercial property fairs. Between 7 and 9 October 2013, HafenCity, lead partner on the shared stand of the City of Hamburg and state of Schleswig-Holstein, will not only be presenting the next important development steps in central and eastern HafenCity but also spotlighting the many high-quality residential building projects. A total 2,500 apartments are currently planned, under construction or being put out to tender in HafenCity. At the same time, the diversity of HafenCity is increasing. HafenCity Hamburg will make its next major and farsighted strides in 2013. 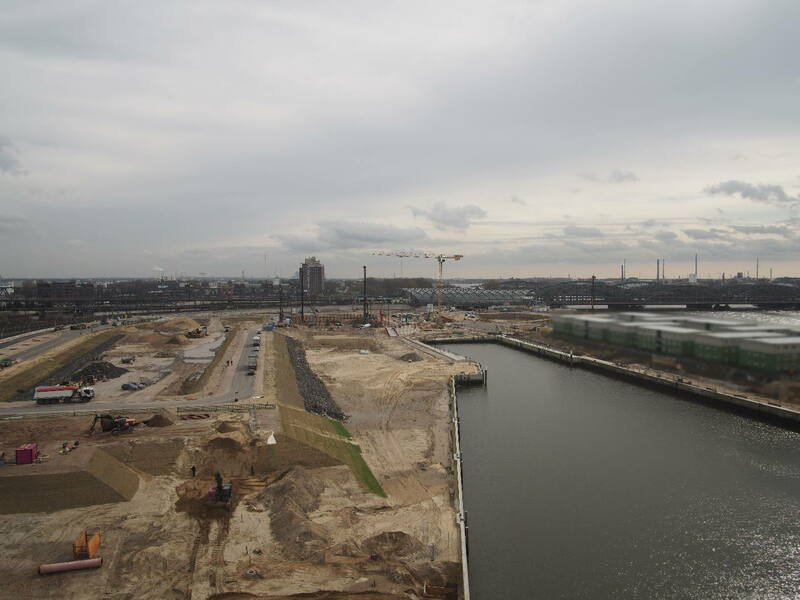 Large green spaces are taking shape, the development of sophisticated residential plans begins, and other substantial projects in the centre, such as the Elbarkaden and HafenCity University, will reach completion during the year. And as HafenCity sets standards for the future through its unusually sustainable brand of urban development – the metropolitan feel of Europe’s largest inner-city development scheme grows. Once again HafenCity is presenting itself at the largest B2B trade fair for commercial real estate in Europe, the EXPO REAL in Munich. Around 1,700 exhibitors from more than 30 different countries and around 37,000 visitors take part with the aim to network, gain market orientation and valuable business contacts. A large stand will also represent other urban development projects in the City of Hamburg.